Can I say everyone in parties loves cheesecakes? If not everyone, then most people are so into trying these little cute cheesecakes. I made some for a bring-a-plate family gathering, they’re gone quickly once served on table. What I like the most about making cheesecakes is that I can make them well in advance, chill in fridge, then bring them along inside an insulated food bag. Then off I go for enjoying the party without any stress. As I got a new kitchen toy – a 12-cup mini cheesecake pan recently, I can’t wait to try this nifty kitchen gadget. Baking cheesecakes turns out into a 20-minute-or-so matter. 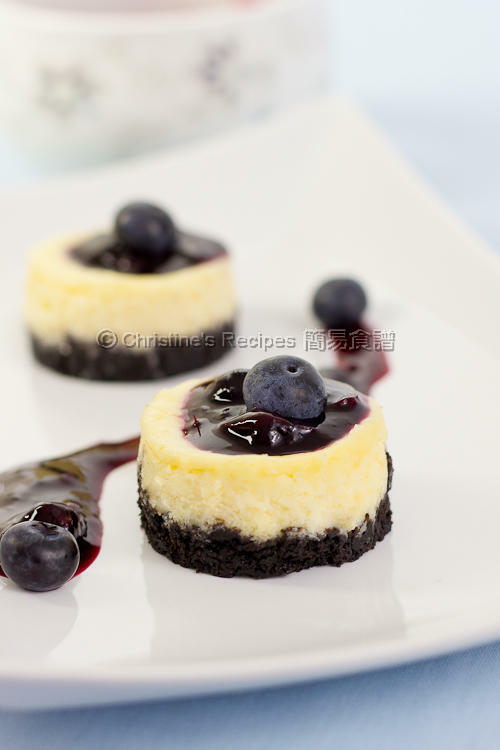 Then simply top the baked cheesecakes with some blueberry coulis, place one or two fresh blueberries for garnish. The presentation is about one minute to finish off. Each guest can enjoy one mini bite of the heavenly tasty dessert, thus free of worrying about calories and sugar intake. So why are mini cheesecakes popular in parties? Put Oreo cookies into a food processor and pulse to fine. Add melted butter and process a few seconds until well combined. Divide the Oreo mixture evenly. Spoon about 2 tablespoons of cookie mixture into each greased cavity of the cheesecake pan. Use the flat end of a rolling pin, the back of a spoon, or your finger tip to press lightly and level the surface. Set aside. Use an electric mixer to beat cream cheese and sugar until smooth. You might need to scrape down the sides of the bowl to mix completely. Add the egg and mix well, followed by thickened cream, lemon juice and vanilla extract. Beat until well combined and smooth. Spoon the cream cheese mixture over each Oreo base. Bake in the preheated oven, for about 20 minutes. Meanwhile, prepare blueberry coulis：Use a small sauce pan, cook the blueberries, sugar and lemon juice over medium-low heat, until the blueberries starts to turn soft and break down. Combine cornflour and water well. Pour over the blueberries bit by bit, stir constantly, until you get the desired consistency. Remove from the heat and let it cool down. You might like to chill it in fridge, covered with plastic film until you need it. Remove the cheesecake pan from the oven. Let it cool on a wire rack. Carefully remove the cheesecakes (as the above picture shown) and take disc off of the bottom of the cheesecakes using a butter knife. Store in an air-tight container and chill in fridge until completely set. 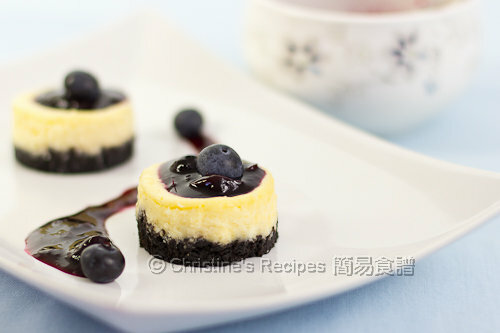 When serving, drizzle blueberry coulis on top of each cheesecake and place a fresh blueberry, or as many as you like. 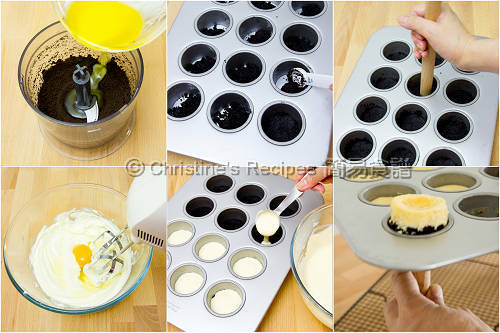 If you don’t have a removable based cheesecake pan, you can use a muffin pan lined with muffin / cupcake cases, and follow the above instructions. The top of cheesecakes will fall a bit when they cool down. The concave surface can help to hold the blueberry coulis nicely. Marvellous ! Hi Christine,I love cheesecakes. Will try out this recipes as soon as possible. Where did you get the cheesecake pan from? I got it from Amazon. Updated the post with the link inserted. Thanks for asking. So glad that your family loved these mini cheesecakes. What is thickened cream? Do you mean whipped cream or heavy whipped cream?? Thickened cream is a kind of whipping cream in Australia, that gelatin is added already. Don't use whipped cream. Christine, I tried this today. It tastes amazing. However, I don't have a cheesecake baking tray so I used a muffin tray. The problem is that when I tried to take the cheesecake out, the base falls apart. What can I do to make sure the base 'comes out'. Secondly, my 'top' cheesecake filling is a little 'hard'/ dry. Any idea what could have caused this? Did you line your baking tray with some paper cases? It'd help to remove the cheesecakes easily and keep the base intact nicely. The cheesecakes shouldn't be too hard or dry. It could be the problem of the temperature of your oven too high, or baked too long. And the material of the tray also brings certain impact on the end products. Thanks for the reply. I didn't put any baking paper on the tray. I will try that next time. Although, after putting the entire tray in the fridge for two days, the cheesecake came off nicely with the base attached. So Thickened Cream is Heavy whipping cream? I live in NY, USA. Yes, thickened cream is a kind of whipping cream in Australia. It's added and thickened with some gelatin already. Thanks you for sharing this recipe! I baked some today and had good response too! Indeed a good recipe to keep. I went out to look for the mini cheesecake pan after reading your recipe but no luck also had to order from Amazon. I'm going to make them today, hope succeed. What do you suggest to replace the thickened milk that your recipe calls for as I could not find the kind that you use in Australia here in the USA)? Thanks so much! S.P. You can use any whipping cream, single or double, for making this dessert then. Can bake this in 7" round pan? my top of cheesecake falls pretty badly. What could be the possible reason? It could be that the oven temperature was too high. Try to reduce a bit next time to see if it helps. Hi Christine, Thank you for this simple n wonderful recipe. I had to bake them for about 32mins under 170degee c coz they seemed to be still wet inside. Still feel they taste very similar to unbake cheesecake, rather than having those texture of soft light japanese cheesecake. Is this normal? Every oven is very different. Also the material of baking tray affects the baking time and end results. If you find your cheesecakes still wet, you might like to increase the oven temperature or bake longer. Hi Christine I tried your recipe last week, the taste was fantastic however I couldn't get the output as what you displayed here. The cheesecake sags once it's cold down to room temperature what was the possibly root cause? The mini cheesecakes tend to shrink a little bit as I mentioned in "notes" section. If it's not too serious, it's normal, not a problem at all. hi Cristine .. can I use all purpose cream instead? Am afraid not, as the texture, fragrance and taste are totally different. Hi Christine :) Love your website / recipes :) Blueberry + Oreo combo = clever idea :) My family n I love both of them :) May I ask if similar recipe works / can apply for non bake version? As I dont have an oven at home, I always explore for non bake version / recipes. I have a non-bake cheesecake recipe on this blog. Please use the search box on top and you'll get it. Hi Christine, thanks to ur recipe I made my first cheesecake and received good feedback. Congrats on your success. So happy for you. Hi Christine, can i bake this in a removable round pan? 7 or 8"
This looks so tempting, cant wait to bake it! An hour or so is ok.
Can I use dairy whipping cream instead of thickened cream, thanks. Yes, your can. The texture will be slightly different. Do you have the recipe that uses the Insta pot,? In writing process. Will post it once it's finished. Thanks for your patience. Can i use a 9inch springform pan to bake this cheesecake? This recipe is good for a 5-inch to 6-inch pan. If using 9-inch, you have to increase all the ingredients by 2.5 times.